Description: The DataTrack System is an affordable, web enabled service and support management system designed for call centers, help desks, customer support centers, IT departments, and software development teams. Comprised of the DataTrack Server, Desktop Client, and Web Client, the DataTrack System offers an innovative, all-inclusive solution for organizations of all sizes and types. Description: PMP is a performance monitor for remote/multiple Windows servers. You can monitor the real time CPU, memory and disk usage status from the several networked servers and can be notified for the specific server status. In addition to the basic alarming methods, PMP provides email notification, automatic/manual remote command execution. PMP also provides HTML reporting and you can share it with other staff. 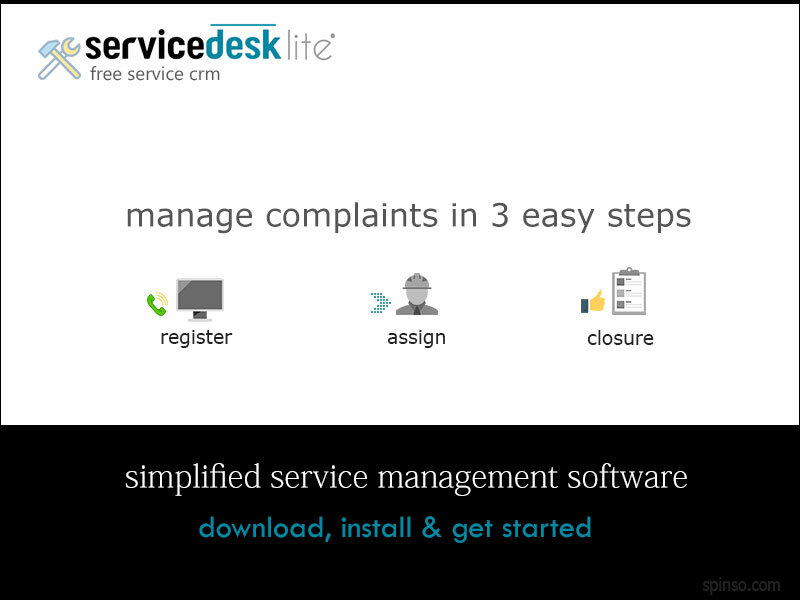 Description: Service Desk Lite is a free service software, useful for service firms to systematically manage customer complaint so that it never goes, unattended.It covers the important stages of Complaint management such as Registering a Complaint, Assigning it to Service Executive & Complaint Closure. The data in Service Desk Lite is stored on your local machine, hence it is faster & easier to access. Simply download install and get started. Description: Service Desk Lite is free ready to use service management software that enables you to manage Service contracts/AMC and customer complaint life cycle from complaint initiation, assignment to closure in a very simple way.Service management is made simpler with Service Desk Lite.Service Desk Lite is useful for service firms to systematically manage Service Contracts and track customer complaint so that it never goes, unattended. Description: Real-time and interactive PC inventory management software. You can examine your hundreds or thousands of client PCs' hardware and software automatically, track hardware/software modifications and upgrade requirements, detect pirated software, remotely control client computers, and manage all PC inventory issues. In this version, new log management, XML report, improved user interfaces are added. Description: Web based repair tracking application for computer and console repair shops of any size. Multiple sites can be managed with complete invoicing, workflow, parts inventory etc. The system is highly configurable and can be tweaked to suit your business. TrailBlazer has many great features such as status views and remote book in for trade customers, automatic customer alerts for any stage of repair, technician and admin alerts, flexible security etc. Description: With workOrder XP you it will be able to manage work orders and services. It includes maintenance scheduling, service status, supply control, and more. Connect to WorkOrder using the web.